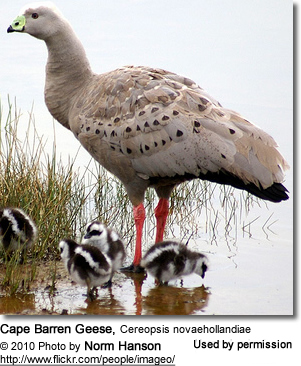 The Cape Barren Geese (Cereopsis novaehollandiae) - also known as Cereopsis Geese or Pig Geese - occur naturally in Australia. This species was named for Cape Barren Island, where specimens were first sighted by European explorers. They were once believed to be the immature phase of the Australian black swan. Last century, they were hunted for food almost to extinction. Due to conservation efforts, their numbers have increased considerably and this species is now relatively common within its limited range. 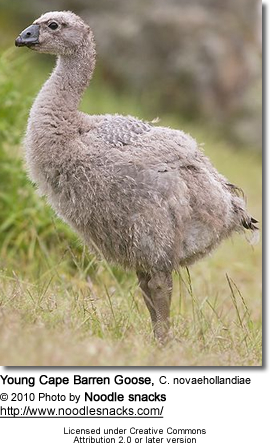 However, they remain one of the world's rarest geese. 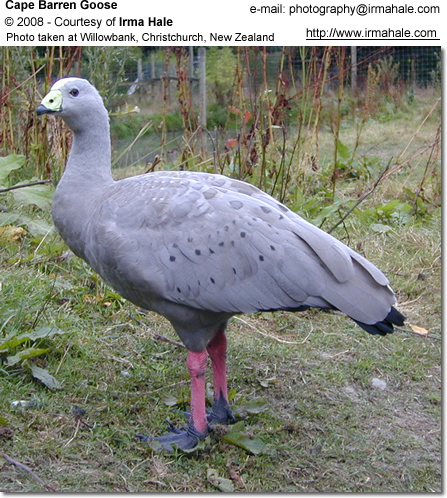 The Cape Barren Goose is a bulky, large goose, measuring 30 - 40 inches (75- 100 cm) in length (including the tail) and a wingspan of 59 - 75 inches (150 - 190 cm). The relatively small head appears to be small for the size of its body. It weighs about 7 - 15 lbs (3.1 - 6.8 kg). Males are generally larger than the females. The plumage is mostly pale grey, except for black rounded spots on the back, blackish flight feathers and tail. The legs are a deep pink and the feet are black. The short, down-curved black bill has a greenish-yellow cere (skin above the beak, where the nostrils are). In flight, it shows dark wingtips and along the trailing edge of the wings. 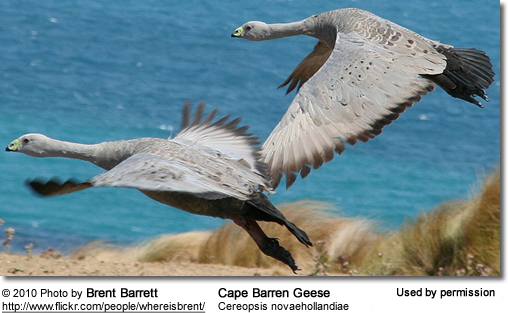 The Cape Barren Geese are found on the south-eastern coast of Australia, and islands off southern Australia, with smaller populations occurring in Western Australia (sometimes described as subspecies: Cereopsis novaehollandiae grisea, doubtfully valid), on the islands of the Recherche Archipelago. Populations are established on the Sir Joseph Banks Islands of South Australia and the Victorian coastal islands around Wilsons Promontory. Smaller populations occur at Cape Portland at the northeastern tip of Tasmania, as well the Hunter group of islands off northwest Tasmania. They have also been introduced to Kangaroo Island, Maria Island off Tasmania's southeast coast), and New Zealand. 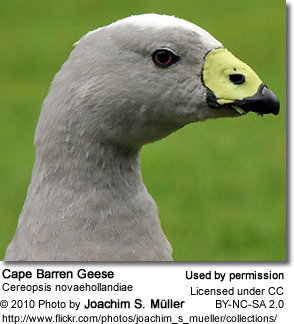 During the summer, Cape Barren Geese typically gather in small flocks on offshore islands, but further inlands, in particularly favorable feeding sites - typically farming areas - large flocks of them can be seen feeding on pastures. These geese have adapted well to feed on agricultural lands, which reversed their previous decline in numbers. In southern Australia, their numbers are estimated to be 16,000 - 20 000 birds, with numbers appearing to be rising. In Tasmania about 14 000 geese are to be found in the Furneaux Group of islands. As of 1995, over 100 birds have established themselves on Maria Island. 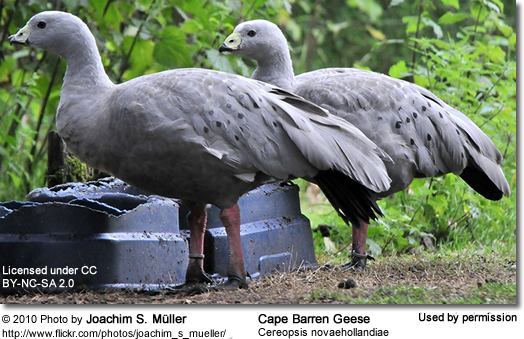 Cape Barren Geese are monogamous, forming life-long pair-bonds. Most breeding activities are observed between May and September. They typically nest on offshore islands covered in tussock, grassland or scrub. In autumn, breeding pairs establish breeding territories and aggressively and noisily defend these territories against intruders, chasing away other geese, dogs, foxes and even humans. The male is responsible for constructing the nest using various grasses and plant matter. The nest is lined with soft down feathers. 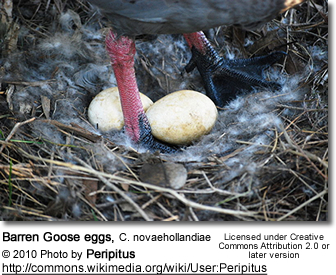 The female lays four to six (sometimes seven) creamy white eggs and incubates them alone for about 35 days to hatching, while the male feeds the nesting female. The hatchlings are covered in black and white striped down feathers. The young are brooded by both parents equally. The goslings grow rapidly during the winter, and are able to fly by the end of spring, at which time families join flocks of non-breeding geese, which have also spent the winter on the breeding island. These geese also breed well in captivity, as long as large enough paddocks are provided. 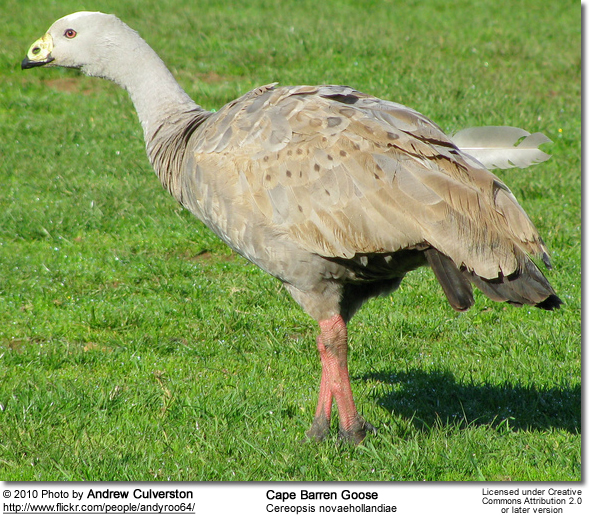 Cape Barren Geese are typically quiet on the ground, unless when alarmed or during their mating displays. In flight, they tend to be more vocal, the male's distinctive loud, trumpeted 'ark, ark-ark' can often be heard. The female's vocalizations end to be higher in pitch. Other calls include loud, deep grunts or honks. 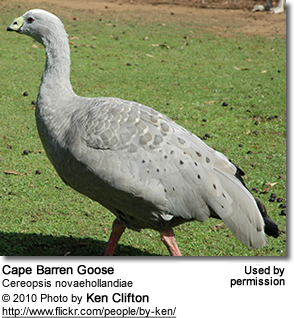 Cape Barren Geese feed by grazing and rarely swim. They mostly feed on the common island tussock grass, as well as spear grass and various herbs and succulents. They are also often seen feeding on pasture grasses, including barley and clover, and legumes.